Posted on October 16, 2018 December 15, 2018 On The PulsePosted in Factor This! It’s goodbye to summer and hello to our first Autumn instalment in our Factor This! blog series. We’re very lucky to feature one of the most internationally recognised haematologists of our time – Professor Flora Peyvandi. Flora has justifiably earned this reputation through her extensive portfolio of basic and medical science research, primarily into the prevalence and molecular mechanism of rare bleeding disorders. She is a prolific author and co-author having written and contributed to more than 400 scientific papers, published throughout well-known scientific journals as well as 21 chapters in various books. Since 1999, Flora has been invited as an expert speaker to over a staggering 148 national and international meetings and congresses, and has successfully procured grant-funding for 40-plus projects by organisations in Italy and worldwide. Flora’s status as a leader in the field is reflected in her various roles, past and present. Notably, she was principle investigator of the Establishment of a European Network of Rare Bleeding Disorders (EN-RBD) from 2007, and was a member of the Executive Committee of the World Federation of Hemophilia (WFH) between 2012-2014. 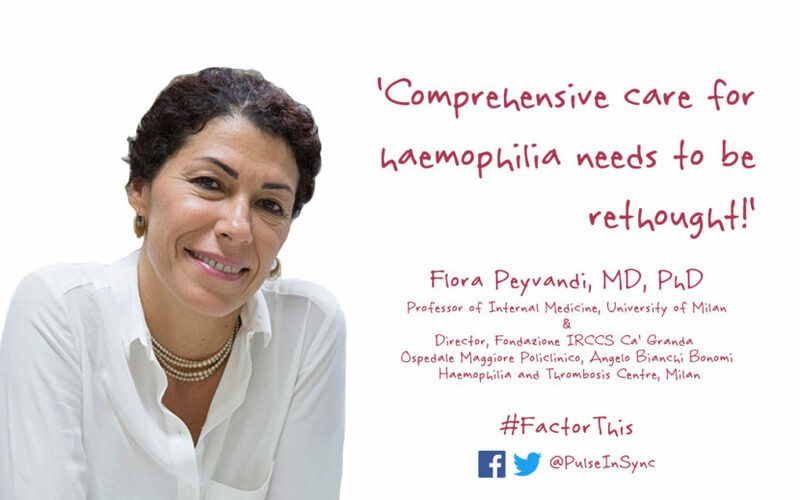 Currently, Flora is Vice President of the European Association of Haemophilia and Allied Disorders (EAHAD), and a Council member of the International Society of Thrombosis and Hemostasis (ISTH) as well as part of the Medical Advisory Group of the European Haemophilia Consortium (EHC). She juggles these community commitments with her day-to-day work as Professor of Internal Medicine at the University of Milan, and Director of the Angelo Bianchi Bonomi Centre for Haemophilia and Thrombosis, Milan. The stats and honours speak for themselves, and if that’s not enough, Flora is also among an illustrious list of recipients of The Great Hippocrates Prize for the Italian scientific researcher of the year. 1) Firstly Flora, did you always want to be a doctor? Really, yes! Even from when I was a kid, say 7 or 8 years old. You have to bear in mind this was the early ‘70s and there wasn’t the same access to information as today. But even to be this young and trying to read what medicine is all about… I just knew I wanted to be a doctor. There isn’t only one single science but rather, so many other things you have to know. Discovery is never ending! 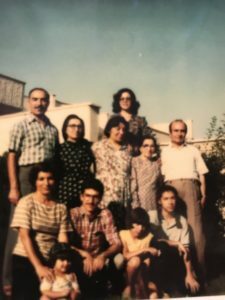 Flora, pictured bottom right, aged 13 with her family in Iran. 2) What prompted you to move to Milan? It was hard for me to cope personally as I was always a free spirit, a little bit wild even. I didn’t have any fear at all! I decided that it was the best time to ‘get out’ and study abroad. During this time, the role of my family, particularly my father, was crucial in understanding my need for freedom and the desire to learn and grow. I was thinking about going to the U.S. but there were too many obstacles to getting a Visa and it was increasingly stressful. I wanted to study in a country where I could go back and forth without restriction – Italy was extremely supportive with this. The application process took one year and having finally obtained the study Visa, I moved to Milan on 5th August 1984. I began my medical studies in the same year. Although young and alone, I fell in love with the style of life and everything in this most beautiful country! 3) Why did you choose to study haematology? Well, when I was in the last year of medical school in 1991, we had to decide which area of medicine to specialise in. I was just thinking, “Oh my word, what do I really want to do? How about being a neurologist? What about…” and so forth. But eventually I decided to focus on internal medicine and haematology. Blood is our lifeline and involved in everything. You have to understand it. It may not have been one of the easiest specialities but you could use the most advanced technology for diagnosis and treatment. This was wonderful! The positions for graduates at the University of Milan were really limited in these fields. Only one or two people were chosen per year. Still, I didn’t let this sway my decision. It was then a case of deciding whether to pursue oncology-haematology – mainly blood cancers – or benign-haematology, so inherited blood disorders. I looked through all of the literature and saw that Professor Pier Mannucci was a haematologist with interesting scientific production on the benign side. The area of haemostasis was fascinating to me! We spoke together and he gave me much hope of becoming a member of his clinical team in the future. Of course, this was on the proviso that I could show my ability to produce good scientific work on top of my training in haematology. I started my haematology fellowship under Prof. Mannucci’s supervision in 1992. As they say, the rest is history! 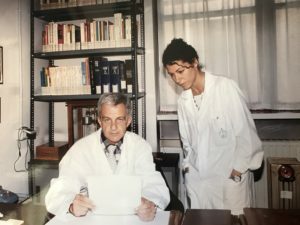 Flora as a young haematology fellow, pictured with her supervisor, Prof. Pier Mannucci, with whom she would form a formidable research and clinical partnership in haemophilia. 4) How significant were these early phases in your career? I always say there are two chapters in my life that have really touched me personally and professionally. The first was at the beginning of my fellowship as well as my residency in haematology working at the Department of Internal Medicine. This was when I started to meet people with haemophilia. Sadly, most of them were dying from HIV.3 It was terrible and one of the worst experiences that a young medical student can face. It was touching to have been in their presence, especially as they were so obliging towards us in such tragic circumstances. None of us knew how to make the situation better, even though we were all trying to offer the best available care at that time. This episode would heighten my sense of caution whenever using a new drug and shaped much of my future work. 5) And what was the other ‘chapter’? It was whilst doing my PhD and becoming aware of the prevalence of hepatitis C in those living with rare bleeding disorders at home in Iran. And so, the focus of my doctoral thesis became the molecular characterisation of people with rare clotting factor deficiencies – abnormality of genes which control coagulation proteins – in both Iran and Italy. I didn’t realise at the time that Iran had the highest number of individuals with a rare bleeding disorder. Our group of patients with factor X deficiency – one of the most severe forms – had the highest need for replacement therapy because they were bleeding so much. It was also evident that a large number of them had contracted hepatitis C through blood products. This, obviously, was due in part to various restrictions as a result of ongoing conflicts and economic difficulties in the country. But this really affected me, especially knowing that much of Europe already had access to heat-treated, safer products. It made me so angry to see that the production techniques of clotting factor concentrate in Iran were still allowing my people to be infected. Albeit this would improve over time, it taught me a lot that whilst we can appreciate innovation, we must keep an eye on the real-world evidence in the community. 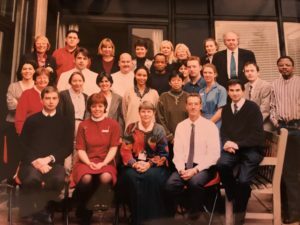 Flora, pictured far left, with the haemophilia team at the Royal Free Hospital, London in 1996, where she spent two years as part of her PhD. 6) There is much debate around product source and inhibitor development. As a principle investigator of SIPPET,4 what was the reaction like from the haemophilia community? First of all, I must stress that SIPPET belongs to lots of actors. From the beginning, there was Prof. Mannucci, Prof. Gringeri, and later Prof. Frits Rosendaal, my team in Milan and different colleagues from all over the world. But just as important were the parents and caregivers of the children, who recognised the importance of what we were doing and wanted to be part of the study. When I knew our study data for the first time had been accepted for the Plenary Session of the 57th American Society of Haematology (ASH) Annual Meeting in Orlando in 2016, I was over the moon! This is considering only 6 to 7 abstracts out of around 2000 are selected for presentation. Nonetheless, I had a feeling it would invite both positive and negative press. From some patients’ point of view, they could appreciate SIPPET was in their best interests. Yet, at the same time, unhappy to learn that recombinant could be more immunogenic. This, to me, is completely understandable. Then there was the reaction from fellow clinicians and industry. In truth, after publication, I had the most challenging year of my life in terms of scientific and personal attacks. My SIPPET colleagues and I made a point to respond to every criticism that came our way in a manuscript in 2016. I was even requested to explain our work in front of a regulatory agency panel – it was like defending my thesis all over again! When you do serious science, it can be tough. They’re not laying the red carpet out in front of you as you might imagine, saying, ‘Your result is fantastic!’ In reality, it can prove to be a real pain in the neck! But to some extent, you have to be thick skinned. I believe the biggest outcomes from SIPPET have been the future outlook around the immunogenicity of current and new products, as well as reducing significantly the cost of clotting factor concentrates throughout the world. For 20 years or so we couldn’t achieve this, so I’m very happy about this result! 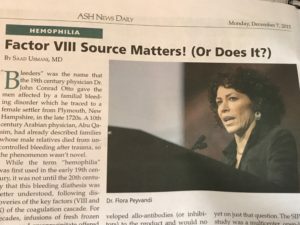 SIPPET causing a stir – a copy of the news briefing from the 57th ASH meeting in Orlando in 2016, where Flora first presented the study data. 7) The first subcutaneous treatment for people living with haemophilia A with inhibitors is now approved in Europe.5 What are your thoughts? It’s the start of a new chapter of therapeutics that are changing the treatment for haemophilia, especially for those living with an inhibitor. But I think we have to remain cautious. There is still a lot to understand around the use of these treatments and the clotting system. We’re building our knowledge-base, piece by piece like a puzzle. But like I’ve suggested at previous meetings, the set-up of haemophilia comprehensive care centres needs to be rethought and changed. A facility just for haemophilia care will no longer be enough. We need a multi-dimensional department that includes thrombosis experts, radiology and other specialities to manage any eventual type of complication from these drugs. A hospital ward with specific experts on hand and facilities so patients can be admitted, should be made available. More than any other time, we, the physicians, need to collaborate and work together as we enter a difference phase in the community’s history. Equally, the patient has to be very knowledgeable and informed about what they’re using. 8) In summary, what is your general view on the latest research and innovation in haemophilia? Innovation and technology are changing significantly the care of haemophilia. We are almost achieving a curative option with gene therapy7 and this is promising. But it’s very important to let people know with haemophilia in the developed world, how privileged they are to have the level of access they do! I’ve experienced such diverse levels of haemophilia care in probably two-thirds of the planet, and it’s taught me such a lot; going from one country with nothing, to another with so much. Yet, I’m encouraged that there are some of the best scientists looking to develop products, which could offer sustainability anywhere in the world. From an educational point of view, it’s extremely important to understand the safety and efficacy as these new products come to market. There should be a good balance between independent and commercially-sponsored studies, and dissemination of data. I believe the resources and funding of the universities and academia are getting less and less, and this can upset the equilibrium. I also think – although slightly contentious – that there should be some sort of tax for every new product that we’re using. For each treated patient in the developed world, the tax generated could support treatment access and healthcare infrastructure where it may not be sufficient or exist whatsoever. Unless we see improvements in quality of life across the board, then I think as scientists we have failed. I certainly would feel that I haven’t fulfilled my obligation to the whole community! Flora is a strong advocate for global improvement to quality of life of those living with haemophilia, including here in Zambia, where she visited as part of her humanitarian aid work with Fondazione Paracelso. Thank you so much to Flora for contributing to our series and we hope you’ve found her life and work as inspiring as we have! Are you a regular reader of our blog? Or is this the first time you’ve visited our website? We would really value and appreciate your feedback to help improve our editorial content and user experience. 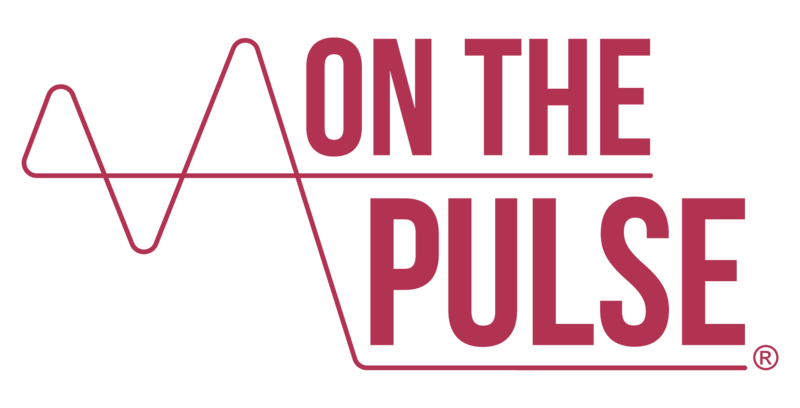 Please get in touch through the usual channels or email us directly at: info@onthepulseconsultancy.com. This site is designed to offer information for general educational purposes only. The health information furnished on this site and the interactive responses are not intended to be professional advice and are not intended to replace personal consultation with a qualified physician, pharmacist, or other healthcare professional. We cannot provide individual medical advice. You must always seek the advice of a professional for questions related to a condition, its symptoms, and appropriate therapeutic treatments. The Iranian Revolution refers to the 1979 overthrow of Iran’s monarchy and the establishment of an Islamic Republic. The Conversation has recently covered the Iranian Revolution in their new editorial series on key moments in the past 100 years of world political history – read it here. Iraq invaded Iran on 22 September 1980, triggering a bitter eight-year war that destabilised the region and caused catastrophic consequences for both countries. To learn more about the conflict and the significance of the Iranian Revolution the year before, watch this short summary feature by HISTORY here. We have commented substantially on contaminated blood in this series. Please refer to our previous features here for information and resources related to the history of contaminated blood in the haemophilia community. Also, in light of last month’s preliminary hearings of the UK’s Infected Blood Inquiry, we will be publishing our own editorial dedicated to the background and impact of contaminated blood in due course. The Survey of Inhibitors in Plasma-Product Exposed Toddlers (SIPPET) Study was the first randomised clinical trial involving 42 sites across 14 countries in five continents, that considered whether recombinant clotting factor concentrates are associated with a higher risk of inhibitor development – an immune response to clotting factor treatment – compared to plasma-derived concentrates in previous untreated patients (PUPs) living with severe haemophilia A (clotting factor VIII deficiency). The results suggested that treatment with recombinant factor VIII (rFVIII) is associated with an 87% higher incidence of inhibitors than treatment with plasma-derived factor VIII containing von Willebrand factor (pdFVIII/VWF). The original study paper published in the New England Journal of Medicine in May 2016, is available to read in full here. You can also visit the SIPPET website for further information. In February 2018, the European Medicines Agency (EMA) granted marketing authorisation for Hemlibra® (Emicizumab; Roche/Chugai) to prevent bleeding or reduce the frequency of bleeding episodes in people living with hemophilia A with factor VIII inhibitors, both children and adults. At the time of writing, it is not approved for use in people living with haemophilia without inhibitors in Europe. Visit the EMA website for more details. Check out our last editorial in this series with Dr. Glenn Pierce, who discusses about gene therapy and his expectations for what this could hold for the haemophilia community.